Over the years Brian and the team have been honoured to get the opportunity to welcome some of the worlds most outstanding winemakers. Our event planning starts with Brian tasting a selection of wines and then designing a four-course meal to complement the specific range. As always, his dishes use only the most premium of Scottish produce. We've put together a small compilation of our Wine Dinner food and wine match highlights from evenings past. Enjoy! This winery is producing wines that are a real benchmark for the entire region. For many of our guests the next wine, the 2015 LAN D12 Rioja, was the standout wine of the evening. This was matched to Brian's confit duck pastilla with softly smoked succulent duck breast, and compote of spiced plums. Temperanillo and Manzuelo grapes are hand harvest from vines that boast an average age of 30-40years. The 2015 vintage saw a wet winter followed by a hot summer which dictated an early harvest. Initial fermentation takes place in temperature controlled steel tanks. This preserves maximum aromatic quality and aids in the extraction of colour. Malolactic conversion is adopted to balance the wines acidity and create a soft and round mouthfeel. Aged then in American and French oak for 12 months followed by a year in bottle before release. The outcome of this meticulous vinification is nothing short of outstanding. Presenting fabulous deep cherry colour with purple hues and smelling of violet and licorice-laced red fruit. On the palate classic features of black pepper and redfruits prevail, marrying perfectly with the spiced plum compote. Pastry on the duck pastilla highlights the beautiful round savory notes of this wine while the red fruit qualities bring out the succulant flavour of the smoked breast. A delightful dish match to this outstanding red. Susana's wines are seen to be a leading force and produce some of the most highly revered of Argentine wine. Her title 'Queen of Torrontés' is indisputable. Medallion of Scotch beef with kale and garlic puree and roast parsnips was served up as the main course and matched with the standalone favourite of the evening, Susana Balbo's 2013, Limited Edition Crios Tannat. Visually, the wine has an intense black colour- giving the palate no preconceived idea on what exact taste may ensue. The nose reveals delectable notes of black fruit and blueberries, accented with a mild smokey quality to intrigue one further. Initially, the flavour is inviting, juicy and plump. The smooth beginning soon develops into a wine with robust intensity. Its long, gobsmacking finale leaves your taste buds wanting more. Black fruits lovingly match with the beautifully cooked Scotch beef. Garlic puree kale brings a great firm flavour to match this powerful red. Roast parsnips add texture to the dish and give an earthy yet sweet quality, that further enhances the complex fruit characters of this outstanding wine. Tenuta Olim Bauda Winery is unanimously referred to by wine experts as one of the best of Piedmonte. Gianni Bortolino showcased a range of spectacular wines on this evening, but a firm standout was the wine match to the mid-course of chicken and ham hough lasagne. This dish features delicate hand made pasta sheets, layered with chicken and beautifully salty ham hough. Finished with a cream based (but not overbearing) Madeira sauce. 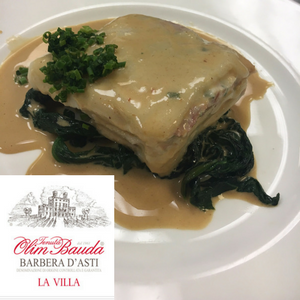 This dish is a stunning feature alone, however, paired with Tenuta Olim Bauda's Barbera d'Asti DOCG, 2016, it's flavour shone through. Not oak treated, what strikes first on the nose is a delectable red fruit quality. The wine evolves in intensity as the glass allows the wine to air-rate. The jammy red fruit is reflected on the palate, and with fantastic structure and balance the roundness of this wine is utterly outstanding. The salty ham picks up the sweet red fruits, and the sauce picks out the small tannin features in the lingering finish. This wine is a true reflection of the quality of this winemaker - no guest would guess the 15% ABV with this non-abrasive and extraordinarily approachable and charismatic wine. This exclusive dinner's last course featured a selection of premium cheese from the region. We featured Manchego, Luna Negra and la Parel cheeses all served with a stunning tomato relish lovingly prepared by Brian and his team. Finca Torrea 2010 featured alongside. Predominantly Tempranillo features again, the classic grape of the chalky clay and limestone soils of the Alavesa region. It produces gorgeous wine with hues of violet and black cherry. This particular wine is hand harvest and destemmed before light pressing. Maturation occurs for 18 months on French Oak followed on with bottle time. It's elegant on the palate with good structure and roundness from oak, yet remains fresh with a charming fruity finish. The perfect jammy end with this cheese course. Brian and the team at Le Chardon d’Or are honoured to announce our upcoming Wine Dinner for Wednesday 22nd of May. We welcome host Louise Höpler of the Austrian, family owned, winery Höpler, to showcase a selection of wine from their multi-award-winning portfolio. If you would like to attend our special events and wine dinners, join our mailing list by filling out the contact form below and make sure you're the first to know about our planned dates. We hope we can welcome you all very soon!